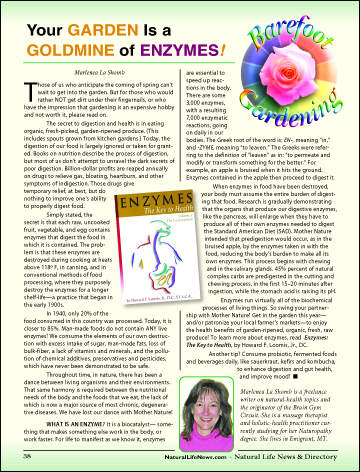 Your Garden Is a Goldmine of Enzymes! Home/Barefoot Gardening/Your Garden Is a Goldmine of Enzymes! Those of us who anticipate the coming of spring can’t wait to get into the garden. But for those who would rather NOT get dirt under their fingernails, or who have the impression that gardening is an expensive hobby and not worth it, please read on. The secret to digestion and health is in eating organic, fresh-picked, garden-ripened produce. (This includes spouts grown from kitchen gardens.) Today, the digestion of our food is largely ignored or taken for granted.